Police at a checkpoint in Southeastern Mexico discovered 513 migrants inside of two trucks bound for the United States. Officials in the state of Chiapas said the men were coming from Guatemala and were traveling in dangerous conditions. Some of the migrants were severely dehydrated and there was no food or water provided for them. Someone had cut air holes in the bottom to allow air to enter the truck. There was no word on whether a drug gang was responsible for organizing the transportation, but migrants told police officials that they paid $7,000 each for passage. Police arrested four people from Central and South America and Asia in connection with the crime. 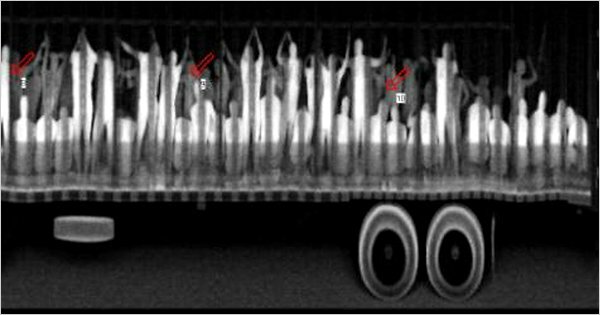 They spotted the migrants when the trucks were X-rayed at a checkpoint. See a photo from that inspection above.